New York lost a net 1.6 million residents to other states between 2000 and 2010, according to 2010 Census data. 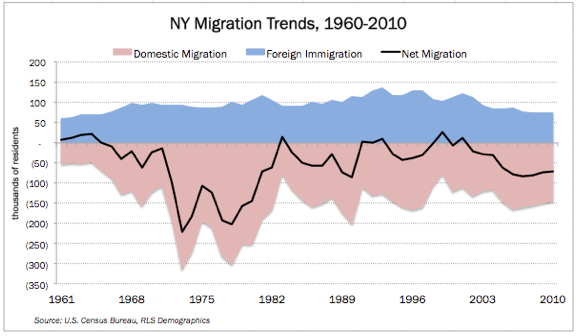 The domestic migration outflow, coupled with a slowdown in foreign immigration, ensured that New York’s share of the nation’s population continued to slide in the first decade of the 21st century. But the migration trend is also nothing new. Since 1960, New York has lost 7.3 million residents to the rest of the country. This was partially offset by an influx of 4.8 million foreign immigrants, resulting in a net decline of 2.5 million residents. New York’s average annual domestic migration loss – the difference between people moving in from other states and out to other states — jumped from about 60,000 people in the 1960s to an all-time high of nearly 237,000 in the 1970s. The state’s domestic migration outflows have averaged between 130,000 and 160,000 a year since 1980. For a second consecutive decade, New York’s net population loss due to domestic migration was the highest of any state as a percentage of population. New York’s net migration loss – the sum of domestic and foreign migration – increased over the last decade to its highest level since the 1970s. Thirteen states had negative net migration between 2000 and 2010, and only three (Illinois, Louisiana and Michigan) lost a bigger share of their populations to migration than New York. Immigration to New York from foreign countries peaked at 1.2 million people in the 1990s, balancing out 91 percent of the loss due to the domestic migration of New Yorkers to other states. As a result, New York’s net migration loss in the 1990s was the lowest of any decade in the past 50 years – a total of just 109,000 people. But foreign immigration dropped by 25 percent to a total of just 895,150 in the past decade, reaching the lowest level since the 1960s. As a result, between 2000 and 2010, New York sustained its biggest net migration loss since the 1980s. New York’s foreign-born population, which had risen sharply in the 1980s through the 1990s, increased only slightly in the past decade. As of 2010, New York’s foreign-born population was about 21 percent of the total, second only to California’s 27 percent. As illustrated above, the 1970s was by far New York’s worst decade in the past 50 years in terms of domestic migration outflows. This was also the first (and so far only) decade on record in which the Empire State’s population actually declined. 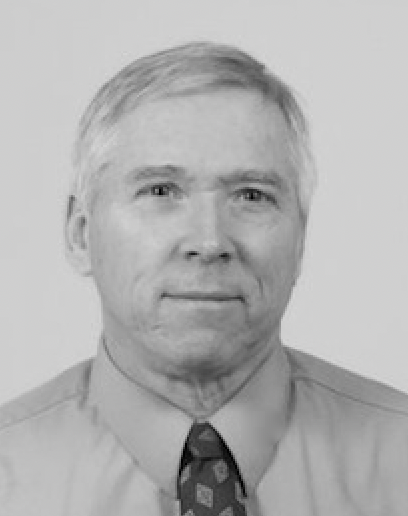 The increase of 2 million people in the state’s total population since 1980, despite the continuing net outflow of residents to the rest of the country, can be attributed mainly to the “natural increase” of births over deaths. But since New York’s population has risen much more slowly than the national average, it has lost 10 congressional seats since 1980, and will lose two more based on 2010 census results. 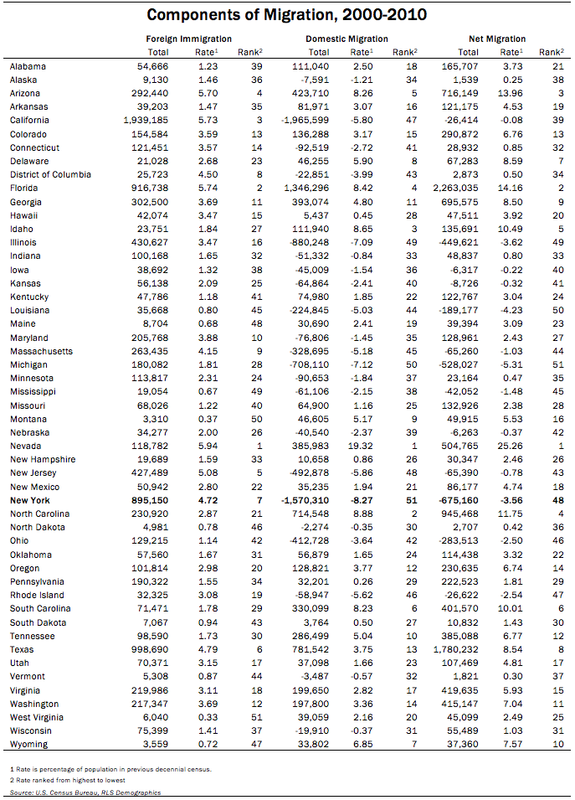 Between 2000 and 2010, as shown in the table on page 3, New York was one of 22 states (plus the District of Columbia) that lost more residents than they gained due to migration within the United States. The domestic migration losers were concentrated in the northeast and Midwest, while the biggest gains were experienced by states in the southeast and west. Exceptions to this pattern included Maine, New Hampshire, and Pennsylvania, all of which gained residents from other states. New York’s loss of nearly 1.6 million residents to domestic migration was equivalent to 8.27 percent of its base population at the start of the period, higher than any state or the District of Columbia. All 50 states registered population gains from foreign immigration between 2000 and 2010. New York ranked fourth in total foreign immigrants, and seventh in foreign immigration as a rate of base population. But combining the two measures, domestic migration and foreign immigration, only 13 states including New York were net migration losers, and New York’s 3.56 percent rate of net migration loss was the third highest. Other net migration losers were California, Iowa, Kansas, Louisiana, Michigan, Nebraska, New Jersey, Massachusetts, Mississippi, Ohio, Rhode Island and Illinois. 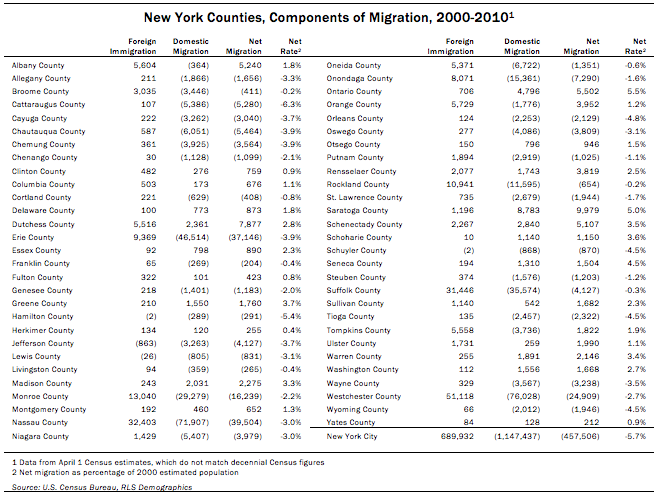 As shown below, New York City was the epicenter of migration in and out of New York State. Technical note: The official 2010 Census results for New York City, which are incorporated in the statewide data cited in this report, were 200,000 below the Census Bureau’s July 2009 estimate. The Census showed an unexpected increase of 82,000 vacant housing units in New York City, which city officials believe to be inaccurate. As a result, the city may challenge the figures through the Census Bureau’s Count Question Resolution program. 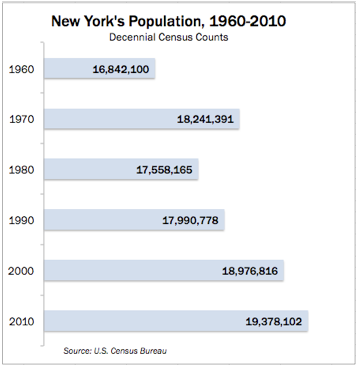 Any addition to the 2010 Census count for the city would have the effect of reducing the net migration total for New York State during the past decade.